Whew, time flies. It's already been a whole year since we started developing Thyrian Defenders. I don't think either of us anticipated it would take so long to make a shoot em' up, but we have no complaints. 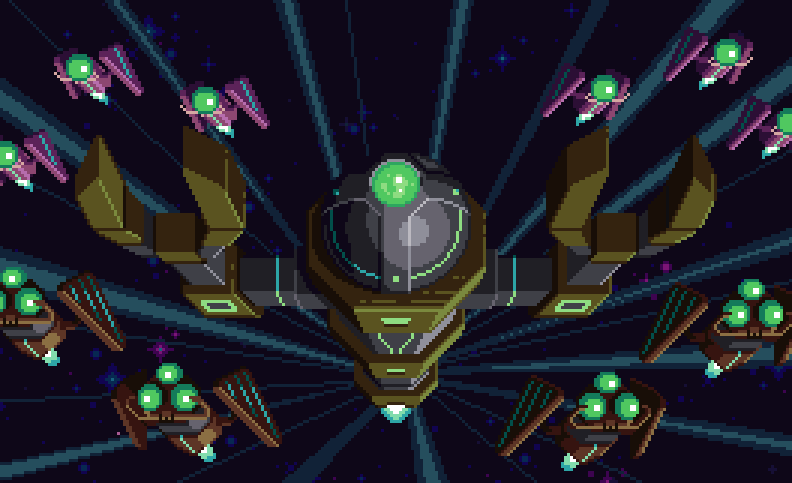 What started as 'hey, let's make a scaled-down side project with a short dev cycle,' quickly became 'hey, let's make the best shoot 'em up ever.' Now, after a year of solid development the potential for greatness makes the commitment totally worthwhile. Considering the quality and quantity of content, I say we're still making good time. It's been quite a long time since I've given a progress report, so for this devlog I'm going to hit you with all the noteworthy updates from the last five months or so. 2nd Player - In addition to the main character, Taz, we've created another fully playable character. Let me introduce you to Suri, a confident young woman who tries to keep a cool demeanor, but shows a spunky side in the excitement of battle. This duality gives her an awkward cuteness that everyone seems to be aware of except for her. In the mobile version the player can choose if they want to play as Taz or Suri before each mission. In the Steam and console versions Suri will be the second player in 2P co-op mode. While there are no gameplay differences between the two character's, the cosmetic differences and unique voiced over one liners keep things fresh. Sound Effects and VO - We have been working on SFX and VO in collaboration with sound design students in England for a few months now. Things are nearing completion and sounding quite nice. Voice over wasn't even in the original plan, but when the opportunity came we couldn't pass. Currently, we are in the process of balancing and applying effects to the final cuts. I can't wait to share some examples in context once we actually start implementing the VO into the game. Player Profiles - In order to emphasize the characters and bring more personality to the game, we've included constant character profiles into the HUD for the main characters and the wingmen. To make it worth the space they occupy we've given them animated feedback when taking damage, receiving power ups, and so on. We've even included mouth movements for when they speak. In addition to VO, there will also be text bubbles that sometimes pop out of the profiles. Roll animation - It seems like a small thing, but it gives the sprite so much more life when it actually tilts into lateral movements. 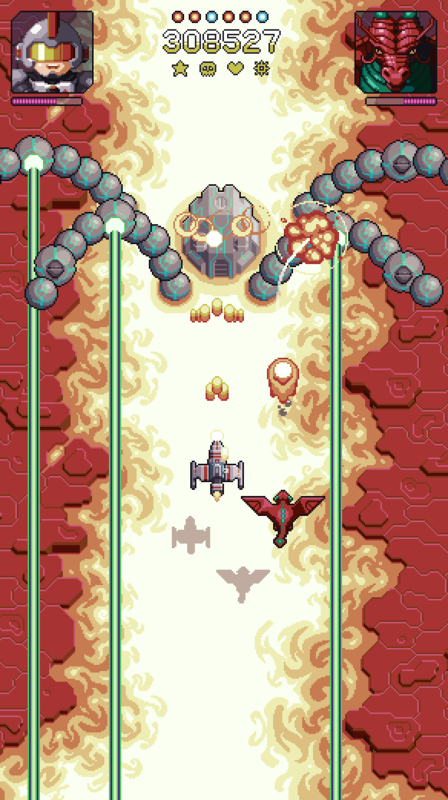 This is pretty much standard animation in all shmups but it was somewhat difficult to get right. First, the sprite itself is quite detailed with persistent directional lighting. Then, all the power up feedback animations needed to adapt to the animated sprite. Finally, implementing the nuanced movement to look natural with the touch control took several iterations to get right. But now she rolls baby! Now I just need to make roll animations for some of the wingmen characters. Projectile design and rate of fire - Back in May we changed the appearance of the player projectiles to make them a bit more unique from the enemy bullets, and significantly increased the rate of fire for the second time. This required a little bit of rebalancing to the level design, but now we have a satisfying flow of bullets and heightended sense of action. Magma Tetradon - We completed another boss design earlier this summer, which we are particularly proud of. This squid-like beast required our programmer to spend many hours making handmade animation patterns in order to create smooth and varied motion of the tentacles. The result is another impressive encounter with multiple challenging phases and lots of parts to destroy before blasting its brain to smithereens. Story - Detailed artwork for the intro and use in cutscenes is beginning to take shape. This is one of the last items on the list but I'm anxious to get the style and format established. The goal is to make full screen scenes on the vertical mobile format that can easily be adapted to full screen landscape format for the console versions. Turns out it's not so easy and is going to take a lot of pixels. But, I'm confident I can pull it off with cleverly designed compositions. Thyria is in peril! A calamitous alien force threatens the entire galaxy. New levels - Level 6, Hyperspace Beta was recently completed. The art assets for level 7, Krillis are about 90% complete and we should begin building the level within the week. In total 10 levels are planned, so that means we only have a few left. Moreover, an early 2018 release is still looking doable. Krillis is one of our most radical environments. My artistic vision extends far beyond the work on Thyrian Defenders. For the sake of my happiness and well-being I must pursue this vision. 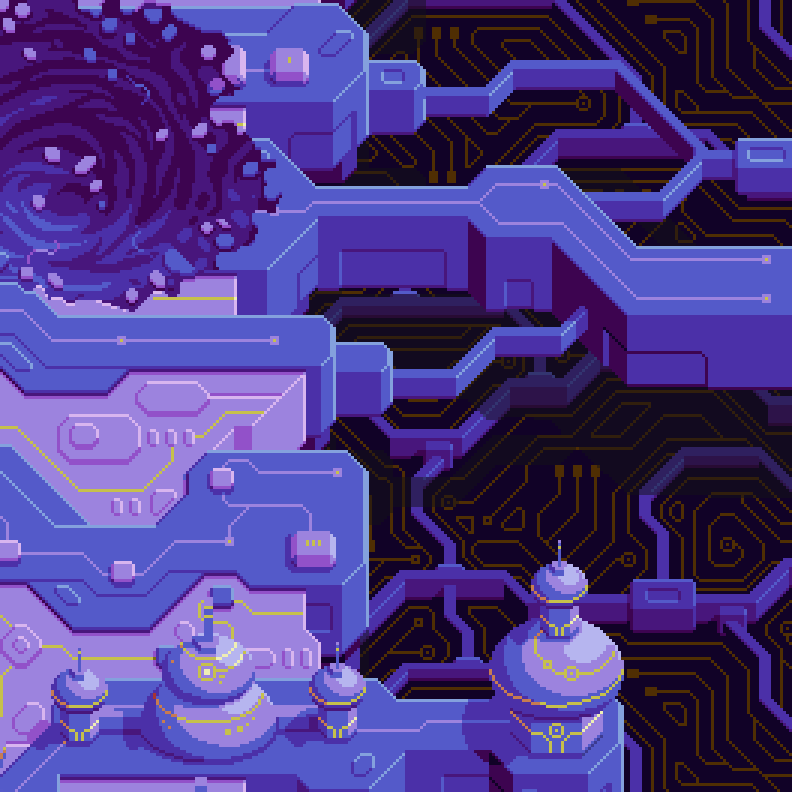 At the beginning of August I launched a Patreon page to provide a platform for more pixels and some financial support. The content mostly focuses on my original pixel art, but the funds directly support the development of Thyrian Defenders by allowing me to continue working. Just one example of the kind of artwork you can unlock and have early access to every week for only $1. 100% quality, consistently produced content on a weekly schedule. However, It cannot be sustained without financial support. How much do you value my work? You read the whole article. I'm impressed. You should be caught up on all the major updates now. Stay tuned for more and keep up on facebook and twitter.